DoubleClick Campaign Manager is the tool you want if you need to manage your digital advertising campaigns across multiple platforms within one simple tool. And while you can use their reporting tool to see your DCM data, creating DoubleClick Campaign Manager dashboards with DashThis allows you to see ALL your data together, including data from every other platform you use! Create your DoubleClick Campaign Manager dashboard today! This list widget shows your top ad placements in order of number of impressions. This trend widget shows how your ad’s click rate has evolved over time. This multi-column list widget shows your Cost Per Conversion, Cost Per Revenue, and Total Conversions together in order to see the relationship between the three metrics. This historic widget shows the total number of times that your ad was shown to your target audience. Want to see all our DoubleClick Campaign Manager preset widgets? This shows the total revenue for all conversions, including both click-through as well as view-through conversions. This is the derived cost for your ad campaign divided by the number of conversions. 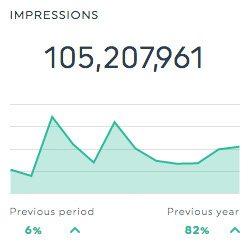 This shows the number of impressions. This shows the total amount of revenue attributed to view-through conversions. View-through conversions are those that occur when a customer sees an ad, then completes a conversion on your site without clicking on another ad. This shows all the conversions that occur in the particular reporting period that can be attributed to a click on an ad. This shows the percentage of impressions that result in a user clicking an ad. This is calculated by dividing the number of clicks by the number of impressions, then multiplying the total by 100. This shows the estimated total amount of money spent on the campaign or ad during the chosen time frame. This is the cost of your media divided by the total revenue. This dimension allows you to isolate your data by a single Floodlight tracking element used to track any action (such as a click, download, lead, or sale) performed by a user on your site after that user has clicked on or seen your ad. This dimension allows you to isolate your data by the DCM site placement name of the DCM click matching the Google Analytics session (premium only). Want to see all our DoubleClick Campaign Manager metrics, segments & dimensions? How do I create a DoubleClick Campaign Manager dashboard report?